I've been concentrating on Hawaiian steel now for the past six or seven years, and have been fortunate to earn my living doing it with people like 'Asleep at the Wheel', Johnny Gimble, and Leon Redbone. More people are getting "re-exposed" to the sound of lap steel and I believe the future is bright for players who want to pursue it. Many pedal players are doubling on "straight" steel to add new colors to their vocabulary of sounds, and their efforts are appreciated by players and listeners alike. I thought I'd kick off my lap steel series with a little excursion into the area of steel guitar tunings, since it's the topic I get asked about most. Many players, including myself, have spent countless hours searching for the ultimate tuning that "has it all". The truth is a great player will sound great on most any tuning. It takes years to approach the potential of a tuning and to carve out in your mind a map of its sounds and positions. Ten years ago I was a floundering in a maze of steel guitar setups and was forced to abandon my search for "tuning perfection". I progressed a lot faster when I narrowed my vision down to a few basic tunings and got down to the business of learning how to play! Below I've listed some example tunings for steel guitar that we can use to illustrate a few points. If you have a six-string steel, just ignore the bottom two notes of each tuning. Let's look at a few criteria for evaluating tunings and see how our example tunings stack up. My intention here is not to recommend or disqualify any of these tunings, but simply to share my observations about some of the possible strengths and weaknesses of various setups. Single note work places a special set of demands on the player. At brisk tempos we don't want to have to move the bar too much up and down the fretboard. In addition we don't want to have to make too many drastic skips with our right hand picking. Big skips are nice for melody, but we don't want to be forced into it for normal scalar or arpeggiated runs. We can achieve an economy of right and left hand movement if we pick a tuning where adjacent strings aren't too close or too far apart. The A major (above) is simple and straight-forward. The third and fourth strings are a little too far apart, though. We'd move our left hand a lot in moving between those strings. The A diatonic tuning, on the other hand, is basically just a scale. The left hand would be a breeze, but we'd have to do a lot of skipping around with our picks, since the strings are so close together in pitch. The C6th, C13th, and B11th tunings strike a nice balance between these extremes. Except for the bass strings in the C13th and B11th, adjacent strings are at most four and not less than two half steps apart. Scales will lay well and arpeggios will mostly involve picking adjacent strings. In our playing we like to be able to form a mental picture or map of the scale and chord positions on the fretboard. In general our memory work will be easier if notes in the tuning are duplicated elsewhere an octave up or down. Look at the A major tuning. The bottom three strings are just the top strings moved down an octave - i.e. only three distinct notes. Any lick you learn on the top strings will work on the bottom strings. Our memory work is nearly cut in half! Likewise the C6th tuning can be viewed as two identical four string tunings - only four notes. Scale positions on the top strings translated directly to the bottom strings. The E13th and diatonic tunings have very little repetition of notes, so they are not as easy to conceptualize. Steel guitar really shines as a melody instrument and on lap steel fully harmonized melodies are not only possible but sometimes required. Legend has it that in Bob Wills' great bands, the steel man soon got the word that if he liked his gig, he'd better play lots of chords. I know I've had that experience, and believe me I've come to love chords! Chord playing is a complex subject. Let's just touch on a few things. If there's sufficient interest we can take it up at greater length later. At the risk of oversimplifying, if we can play all the inversions of the major and minor triad along with a good number of seventh and ninth chord inversions, we'll have more than we need for relatively full chord melodies. In addition, the more we can get without having to slant the bar, the better. Three note chord slants are difficult and sometimes impossible to get exactly in tune, so the overall effect musically will be better if we mainly use them to "fill in the gaps" or make nice little transitions. The A major is pretty limited in this respect. No minor or seventh triads appear when we inspect the open notes (i.e. straight position) - only major chord inversions. There happen to be a few seventh and ninth type chords in the slant position, but it's tough going for full harmonizations. The E7th is a little better. We've got our majors and sevenths (due to the D string - the seventh in the key of E) in the straight position and some pretty playable minors in the slant position. Now we're getting somewhere! We make a huge leap when we move to the C6th tuning. Here, we find all the major and minor inversions in the straight position, and some very playable seventh, ninth, diminished, and augmented chords in the slant position. The C13th has even more power since Bb, the seventh of the chord, is added. Now we've got majors, minors, the sevenths, and thirteenths all in the straight position, and we retain most of the slants from the C6th. No one is going to find a tuning that has every chord in it. There are ways to work around this in many cases. You can play a two note chord that approximates the desired chord. This happens a lot so it's important to be able to play two strings in harmony up and down the fretboard, especially third and sixth intervals. Again, as with single note playing, tunings with big skips between adjacent strings make double string work difficult. Since most of our melody work sounds the best on the high strings, it's best if we can easily play our thirds and sixths up and down the neck on these upper strings. The A major tuning is good for thirds on the upper two strings, but sixths are difficult. With the melody on the top string, sixths appear only in the slant position and for melody on the second string, reverse slants are required. The E tunings offer a much easier way to play thirds and sixths scales all the way up the neck using just a few forward slants. For sixths pick the top string and the G# string below it. For thirds pick the top two strings of the E13th or strings two and three of the E7th tuning. C6th is probably the richest tuning for slants, since its pitches are evenly spaced and "mirrored" from top to bottom, as noted. Can you rake your thumb across all the strings and create a nice full chord? Many tunings offer this "strum" capability. Many nice effects can be achieved by playing cascading runs up or down the tuning creating a shimmering harp effect. With harmonics an even more brilliant sound can be achieved, with all or most of the strings ringing at the same time. The E13th tunings are probably the most dramatic example of this - especially the first one listed. You can generate lots of chord solo ideas by sticking to one fret, picking up and down the chord. The C6th is also a great tuning to use in this way. The B11th is rich as a strummer, but you have to be careful to not play string one and five at the same time. The presence of a low string like the B11th or C13th can really make the strum sound fat. If used within reason (e.g. an ending chord strum), it can really add to your bag of tricks while keeping you in the good graces of the bass player! Things can really get interesting when you experiment with combination tunings (based on more than one chord) and diatonic tunings (built on a scale). The D9th + A13th is a typical example of a combination tuning. The top five strings form a D9th chord, and the bottom six strings create an A13th chord. The B11th is in a way a simple combination tuning. The top four strings are an A6th chord and the bottom strings (actually, the bottom seven strings) are a B9th chord. In general these tunings can be difficult to conceptualize and greater care must be taken to pick the right string groups. Strumming or sloppy technique will usually be disastrous. Diatonic tunings usually afford tremendous chord melody capability. The A diatonic tuning has all the major and minor chord inversions, and many of the most common seventh and major seventh voicings. It can be viewed as a combination tuning also. Strings 3, 5, 7, and 8 are a simple E7th. Strings 1, 2, 4, and 6 form a simple A6th. Strings 1, 2, 3, 5, 6, 7, 8 form an E13th. Strings 1, 2, 4, 6, 8 create a D major ninth. There's a lot here! One drawback is the narrow range of the tuning. The bottom and top strings are barely more than an octave apart. This means more bar movement up and down the neck to change register. On the other hand, slants are much easier to execute, since adjacent strings are close in pitch (the slant angle is smaller so less motion is required and the slant is going to be easier to keep in tune). This is a complex subject and we're just touching on a few points to get a feel for the possibilities. These tunings are definitely not for beginners, but some great things have been done on them by some great players. Each of the listed tunings has merit, and there are a host of other viable tunings. If you have a two or three neck instrument, you can try to get the best of all worlds, maximizing your ability to play chords, chord melody, single string, etc. You can even switch back and forth between tunings during the course of a single tune or passage. One of the most common setups for western swing was the A6th (just the C6th tuned down) and the E13th. These worked well together for a number of reasons: The A6th is an overall great choice for the reasons cited above. It has all the majors and minors we need. The E13th gives us a strong "seventh" sound and a very strong, fat strum chord to use for endings, special effects, and chord rhythm work, to name a few. You could take a setup like this and add a diatonic or combination tuning, and further expand your chord capability. Keys are also a factor in selecting tunings. If you want to play a sixth type tuning, you could play the listed C6th or tune down to Bb or A. I generally like the sound of the A6th. The high E string balances well with the rest of the tuning. But with 'Asleep at the Wheel' most of the tunes were in the key of G, so I went to a C6th for more open string sounds (all the open notes are in the G scale). The high G note of my C6th sounded a little thin to me, but I gained by having all those open strings. Leon Redbone favors the key of Bb, so I use a Bb6th tuning when I play with him. When I go into a gig blind, I use my normal setup: C13th, E13th, and A6th. The C6th has a lot of open strings for the keys of C, D, F, and G. E13th is good for the keys of E, A, G, and B; and the A6th is good for A, B, D, and E. Open strings aren't everything, but they can really enhance the tonal colors you have at your disposal. 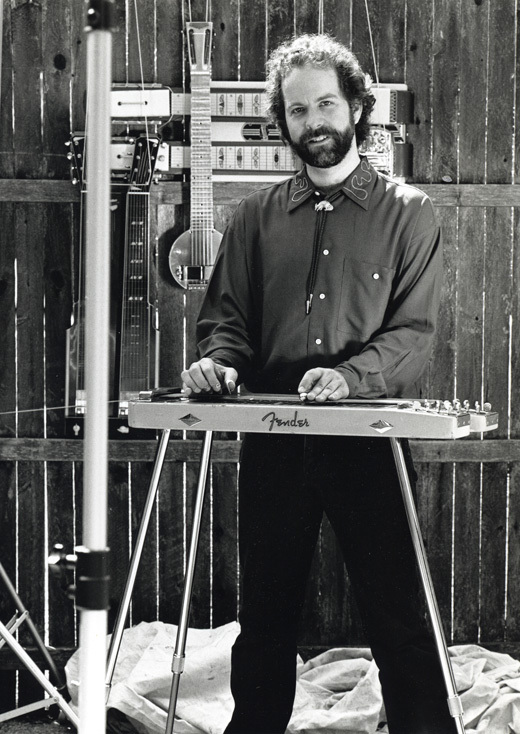 Nowhere in music are instruments and setups as personalized as in the steel guitar world. It adds to the mystique and charm of the instrument and occasionally causes players to tear their hair out. As in the pedal steel guitar world, their is no perfect answer. The C6th tuning and related tunings like A6th are the most popular. They excel in almost all the above categories for evaluating a tuning. It's a good starting point for a beginner. The beauty is it's simplicity in construction and complexity of colors it affords once mastered. The possibilities for experimentation are endless and occasionally fruitful! The thrill of the chase is always there. The history of steel guitar tunings is basically an excursion from the simple to the complex and sometimes even to the absurd. Most will plunge into something basic and take it from there. Happy hunting!